Japanese researchers investigated whether a dominant tree of warm temperate broadleaved forests in Japan, Castanopsis sieboldii, underwent northward migration over hundreds of kilometres from Last Glacial Maximum (LGM) (about 21,000 years ago) refugia in the Ryukyu archipelago and southern Kyushu. Fossil pollen there indicates the LGM survival of broadleaved evergreen forests. Or it may in fact have been able to survive closer to its present range in colder areas such as the coast of the Japan Sea and the Pacific Ocean side of eastern Honshu during the Last Glacial Maximum (LGM). Using a combined genetic analysis and modelling approach, it was found that the East Japan populations, where few pollen fossil records exist, survived in situ during the LGM on both the Japan Sea and Pacific coasts and were not established via expansion after the LGM from southern areas. Their findings were published online in Heredity. 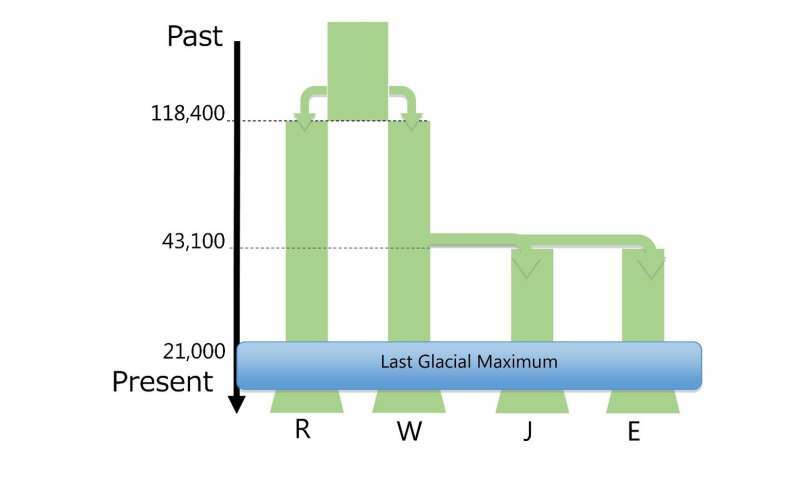 The climate of the earth about 21,000 to 18,000 years ago during the LGM was particularly cold, with average temperatures 5 to 7 °C lower than the present-day. From the excavation of fossil pollen and plant bodies, it is believed that broadleaved evergreen forests were driven to warmer areas in the Ryukyu Archipelago and southern Kyushu during the LGM. After the LGM, they expanded their distribution northward to the Japan Sea and the Pacific coast. There has been a debate on whether the broadleaved evergreen forests, which presently occupy wide areas in warm temperate regions of Japan, had expanded from a limited area in the southern part of Kyushu, or survived in small forests in various areas in Japan. Using a species distribution modelling approach to model the species' LGM distribution, a suitable climate is predicted in the southern part of the Pacific coast (Fig. 1), which is further supported by genetic evidence. Lead author Kyoko Aoki at Osaka University says, "Our research highlights the importance of restricting the distribution of seedlings across the genetic boundaries identified between Ryukyu, Western Japan, Japan Sea, and Eastern Japan in order to retain genetic patterns which have formed over thousands of years."